Petroleum Geo-Services (PGS) has come up with a scheme that would mobilise available fleet capacity to combat the growing problem of plastic waste at sea, writes David Tinsley. The company is seeking external funding to test its concept, which offers a clean-up solution using specialised seismic ships’ air compressors and capability for handling large, wide configurations of towed equipment. PGS’ proposed collection system entails the use of a seismic ship and a support vessel to sweep an area by towing booms in a fan formation, connected to a processing unit at the end of the spread. A towed, ventilated hose would be deployed between the two vessels at a water depth of approximately 50m. The onboard compressors that form part of the seismic ship’s outfit, to supply the seismic source for the designed survey role, would be used to pump air through the ventilated hose. The air bubbles issuing from the hose would be attracted to, and would then attach to, the submerged plastic, carrying the items up to the sea surface. At the end of the collection boom spread, a processing unit would separate organic material from plastic, and clean, compress and pack the plastic into sausage-shaped, floating synthetic skins or tubes. Once full, each skin section would be reference-marked by GPS and AIS, ready to be collected and towed to a processing facility for recycling. In operation, PGS would aim to take advantage of the ocean currents and recover plastic before it eventually sinks to the seabed. Due to adverse market conditions in the seismic survey business, PGS has four of its older Ramform-type vessels ‘cold-stacked’, any of which could be used in the plastic collection initiative. 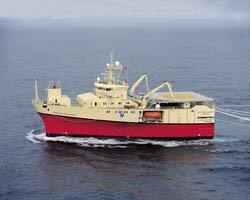 PGS says: “The Ramform vessels' high propulsion power makes them capable of towing large spreads. Their large compressors can generate enough air to lift submerged plastic to the surface. In addition, they have multiple winches, large deck space and accommodation facilities for marine and research personnel.” Bringing ships back into commission for a new role as waste collection vessels will clearly need to be viable for the shipowner. A recovery in the offshore seismic data gathering market would presumably mean first-line recourse to such technologically-advanced, tailor-designed capacity that is presently idled. The amount of plastic ending up in the oceans is vast. The World Economic Forum puts the figure at 8 million tonnes per annum, while the Ellen MacArthur Foundation forecasts that the amount of plastic waste at sea could outweigh the total mass of fish by 2050. PGS’ newbuild programme was completed in March 2017, with the commissioning of Ramform Hyperion, the fourth in a quartet of fifth-generation, Titan-class Ramform ships constructed by Mitsubishi Heavy Industries. At 26,400kW, Ramform Hyperion and preceding sister Ramform Tethys have extra power relative to the first pair of Titan-class vessels. The 2016-built Ramform Tethys holds the world record for the largest seismic spread. This entailed a configuration of 16 streamers, each of 8.1km in length, with streamer separation of 75m, deployed for a multi-client survey over the Aasta Hansteen area of the Norwegian Sea.